Thursday 11 Apr, Puerto Rico day 7: Starting a two days vacation, to explore the north-west end. Drive along Dorado coast to Arecibo. After breakfast we book an AirBnB in Arecibo, so we leave Cloudy Bay alone for two nights. Today we continue the drive along the north coast of Puerto Rico. Good, because the drive back-and-forth from San Juan was becoming tiring and annoying. After San Juan we choose the coastal road, which in places actually runs parallel to the beach. Costa Dorado, which is famous for the golden sand beaches, is our first stop. We pay short visits to several public beaches which are small-ish but nice enough. And quite a few people out and about, despite not being a clear sunny day. But after seeing the long stretches of wild beaches on the south-east and north-east sides, these beaches are somehow not that appealing to us. Dorado town itself is nothing much, the usual town square, a couple of clean-ish streets and the grubby back ones. 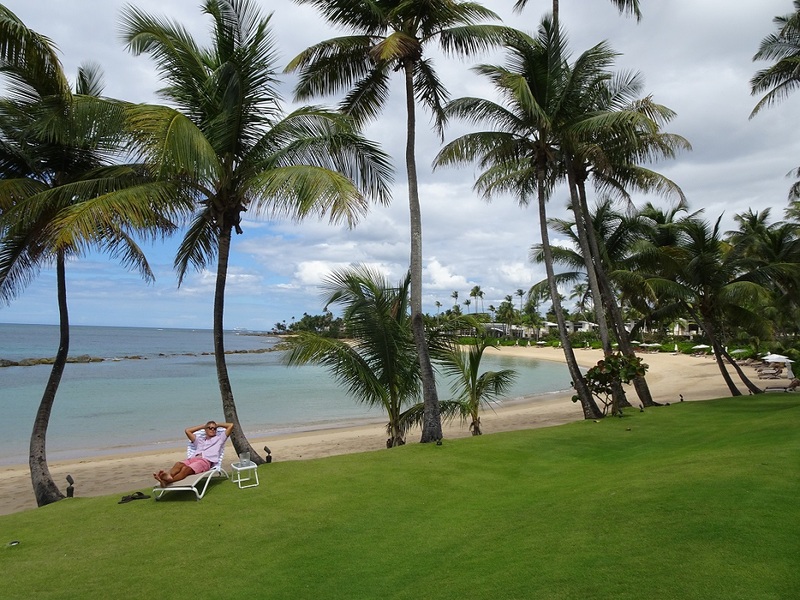 As we continue to drive west, we come across the first fancy beach resort, Dorado Beach a Ritz Carlton Reserve. And of course we want to check out how the other half vacation in Puerto Rico. After going passed the security gate we drive through the nicely manicured gardens and have a brief look at their facilities on west beach. As expected for a 5* resort it is all very pleasant and well kept. We were planning on a drink in their beach bar, but as the starting price was $20 we decided not to! From Dorado to Barceloneta we go slightly inland and to our left we see the Karst Country, an interesting natural phenomena where limestone carver have collapsed leaving a really higledy-pigledy topography. We’ll have a proper drive through it tomorrow. After Barceloneta we continue on the coast road which runs very close to the beach. Yet we see hardly anything of this coastline, due to high sand dunes covered in vegetation. Only on a couple of occasions small paths are cut through. In one of these places we find ourselves walking on a black sand beach. A wide and very steep beach with fine black sand. Very beautiful bay, as black sand beaches go. 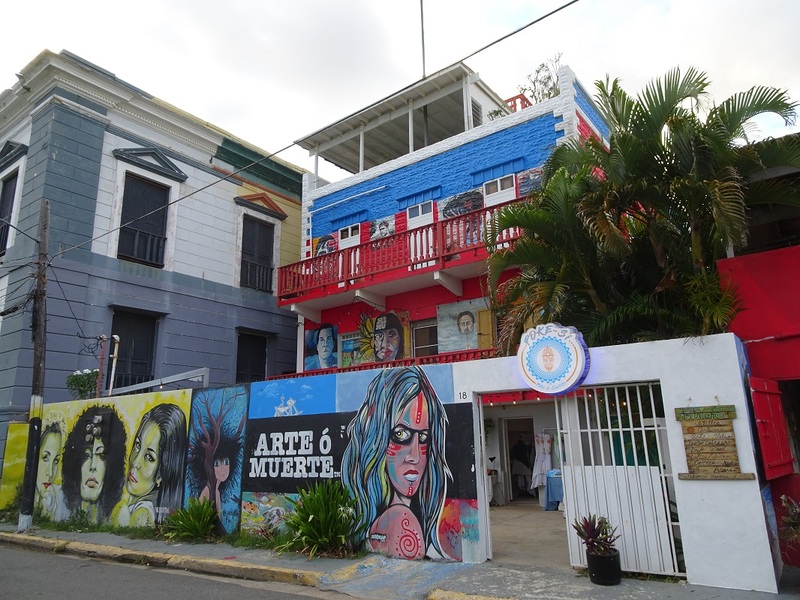 We arrive in Arecibo late afternoon and at the first drive through the town we are disappointed with what we see. Most streets look rather grubby and very run down. And heading out of town to find the place where we booked the accommodation it only gets worse. The AirBnB is located next to a gas station (which is the only landmark we got) and at the ground floor there is a pizzeria and a video rental shop. Nothing too bad so far. But as we walk to the side of the building where the steps for our room are, there is lots of garbage thrown on the ground. Awful. Inside the room, we have a few surprises. The “kitchen” is rather dirty and the shower head looks like the result of an experiment on how to run pipes in the most unusual way. Not exactly what we expected for the price we paid. I giggle (sort of), but Oana starts itching and scratching her skin the moment she enters the room. She always does that when the place is not quite right. So before she gets scratch marks on her arms, we go back out and head back into town. 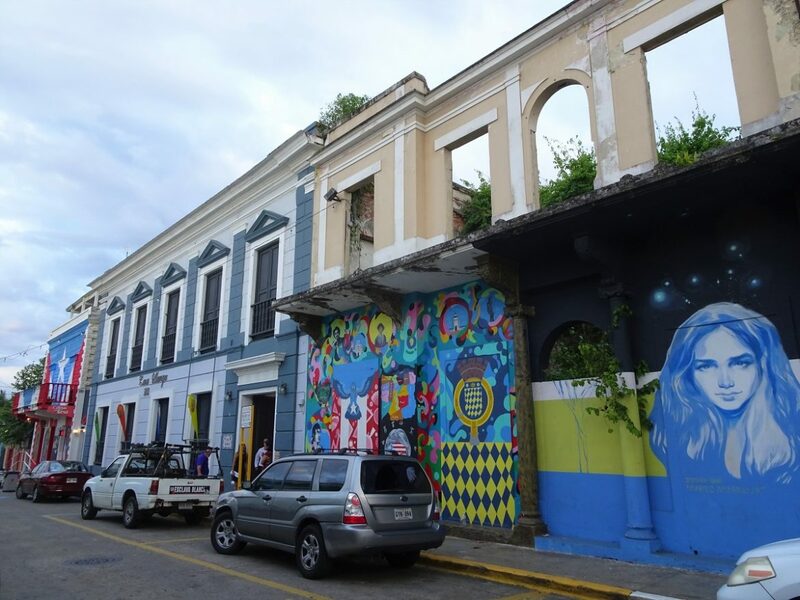 This time we manage to find a nicer part of Arecibo town, on Calle Gonzalo Marin, a street that runs from the town square towards the sea. Some of the buildings are painted with interesting murals, and some are complete wrecks (no roofs, no windows). The colorful buildings are homes to a cluster of bars and restaurants, all very well done and inviting. 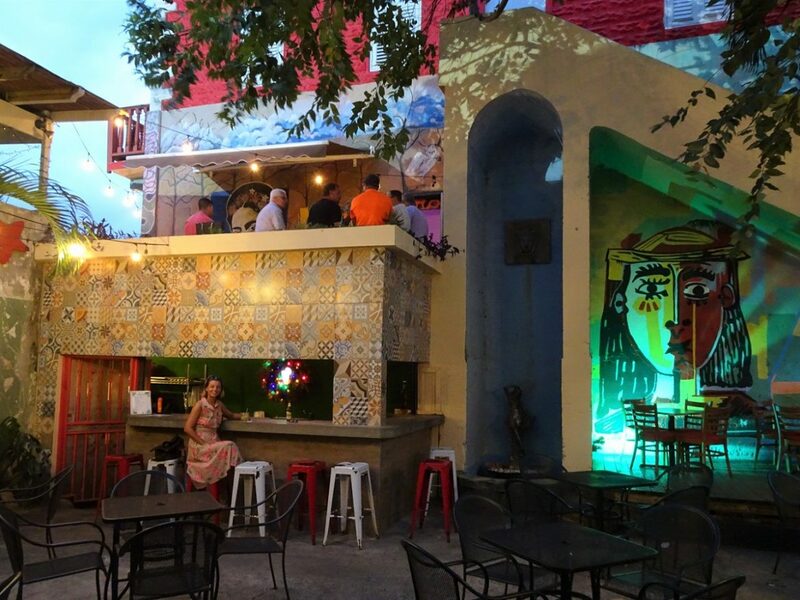 After a quick look in all of them we settle for drinks in the garden of Bodeguita Cubana, under a shady tree. A couple of drinks later we are brave enough to return to our accommodation and take advantage of the WiFi. We have several tasks pending, of which most important is to finalize the travel arrangements for our trip to Europe in June. So the rest of the evening is spent doing that, while listening to the noise of engines and tires from the neighboring gas station. Luckily, we packed earplugs. We are certainly going to need them if we want any sleep tonight!